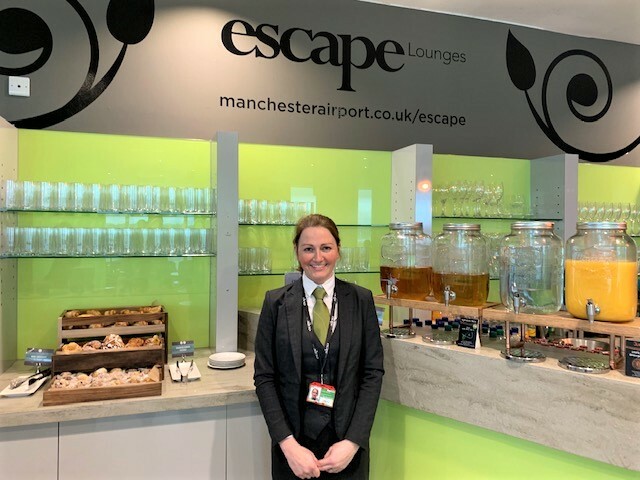 Meet Louise and find out about her role as an Escape Lounge Duty Manager. I have worked for MAG for 2 years. I am currently working in the Escape Lounge in Terminal 3 as a Duty Manager. I have always worked in aviation and love the day to day challenges it brings. What is it like to work for MAG? MAG is an excellent company to work for, there are so many opportunities to train or develop your career within this fast-growing company, and there is always help and support available. I am always learning and developing whilst doing a job I love. A typical Duty Manager shift is different every day. The first thing is to make sure the team are aware of their duties and what area they are working in. I complete checks within the Lounge to ensure that everything is in place and make sure the kitchen team are aware of guest numbers so they can prepare food accordingly. As a Duty Manager, I am responsible for stock management and rotation as well as liaising with the Head Chef. I love my role as Duty Manager as every day is different. You never know from one minute to the next what is going to happen. It is challenging but very rewarding. Working within the Escape Lounge means I can use my hospitality experience to enhance the guests’ experience of the Lounge, whilst also expanding my knowledge within a different setting. Our guests are only with us for a short period of time compared to guests in a hotel, but it’s just as important that they receive excellent service to get their trip off to a great start. What qualities are most beneficial as a Duty Manager? To remain calm and always be one step ahead!